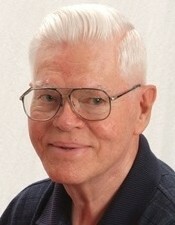 Donald “Don” A. Strom, age 88, of Cottage Grove, passed away peacefully on Thursday, January 24, 2019. Preceded in death by beloved wife of 59 years, Judie; parents, Herman and Hilma; brothers, Richard and Wesley; and sister, Eleanore. Survived by children, Vicki Wilkin, Brian and Brad (Julie); grandchildren, Christina and Scott Wilkin and Lindsey and Lauren Strom; sister, Delores Johnson; brothers-in-law, Mike LaForte and Kermit Frye; and many nieces, nephews, and cousins. Visitation 4-7 PM, Wednesday, January 30, 2019 at Kok Funeral Home, 7676 80th St. S., Cottage Grove, MN, 55016. Funeral Service 11 AM with visitation beginning at 10 AM, Thursday, January 31, 2019 at Zion Lutheran Church, 8500 Hillside Ave. S., Cottage Grove, MN, 55016. Private family interment at Union Cemetery, Maplewood, MN. In lieu of flowers memorials preferred to HealthEast Hospice at www.fairview.org/giving.